Winter is the most loved and popular season amongst the brides and grooms who are going to get married soon. The incredible winter weddings can be made more beautiful by creating wedding cakes that may add a seasonal touch to the grand functions. Bakers are coming up with various ideas to take the creativity to a different level. There are some wedding cakes which look like knitted as your favorite sweater pattern. These are the cable-knit cakes which are very popular amongst the young couples. There are end numbers of such amazing patterns which can blow everyone’s mind. Metallics give a more stylized and royal look to everything, be it any table flatware, stationary, or of course the cakes. Metallics are quite adaptable and the bakers can experiment with different styles using this concept. A geometric shape for a modern feel or beautiful embroidery in gold for a luxurious touch, metallic can be experimented for anything. A little edible sparkle all over the cake will serve as a gleaming decoration. Creativity is at its best with the cable knit cake patterns which are actually designed according to the pattern of your favorite sweater. These cakes are designed to give a seasonal touch to the wedding cakes which is quite a cool idea. They add great texture to a simple white wedding cake. Decorating the wedding cake with fine flair of sugar ruffles in the form of cute frills gives it an elegant and attractive look. This looks very light and cool and further decorating it with fresh flowers gives an extraordinary effect to the whole cake. These kinds of cakes will definitely let the people around to crave badly because of the deconstructed look as they can easily see whole of the mouth watering fillings inside the cake. These are further made more delicious with the toppings of seasonal fruits like apples, persimmons, pears and blood oranges. 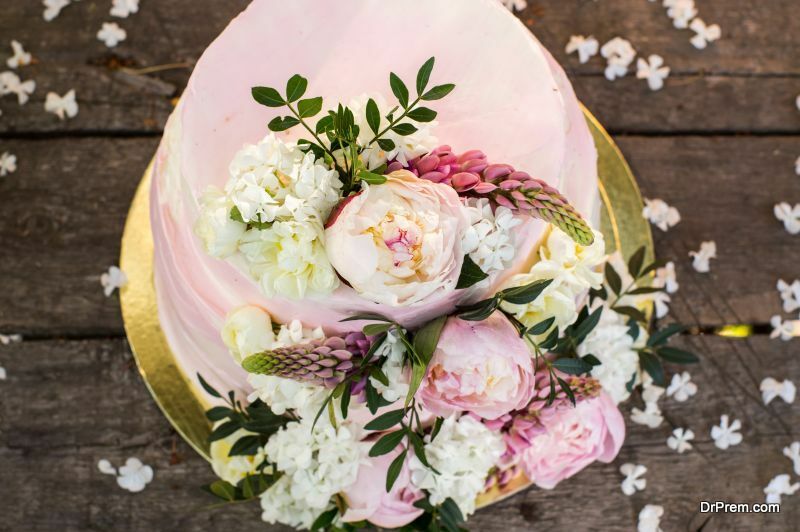 A naked cake is a visual treat for people as all the delicacies used by the bakers in this case are on full display. Some bakers are going artistic by trying stained glass, marbleized or Monet inspired designs for wedding cakes. The hand painted simple tiers can be paired with solid colored layers while sticking to the same shape to give the wedding cake an intricate design. Bakers have been experimenting with different innovative styles, and with the ongoing concept of lace wedding dress, they have come up with beautiful designs of cakes which remind people of the stunning lace gowns. Brides can get the pattern of the lace from their dress highlighted on their wedding cake to make everyone awestruck. The pattern may consist of sugar made buttons or lace designs made up of white fondant which are wrapped beautifully around the tiers. Fanciful earthy themes are very much talked about in case of wedding cake design. 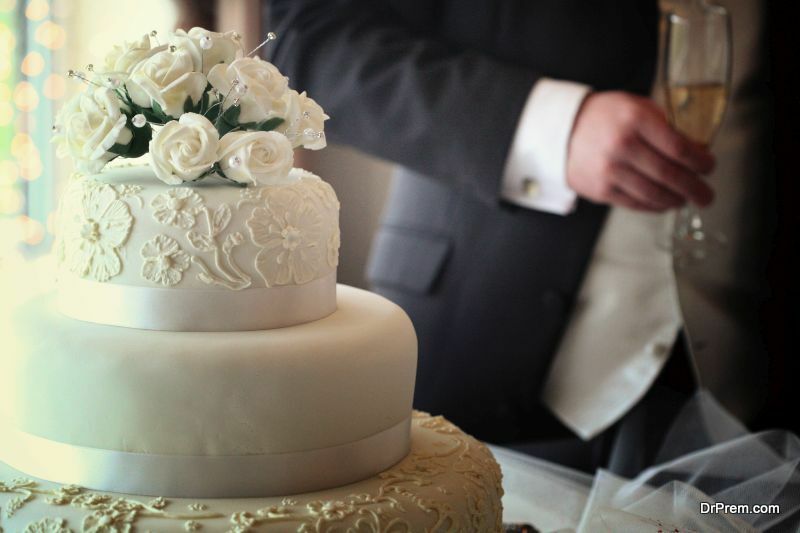 A beautiful as well as delicious cake is all what the couples need for their wedding. The woodland wedding cakes provide a perfect combination of delicious flavor and aesthetic design which can grab everyone’s attention on the wedding day. A simple white wedding cake placed beautifully on the wood tree ring’s top and decorated with more earthy stuff can also create a difference. These kinds of wedding cakes enable the brides and grooms to print anything they want onto them to make their auspicious day even more memorable. They can get their sweetest memory printed on to the cake in the form of any quote, modern art, any classic painting or even the wedding motif like flowers, trees or bicycle. These hand paintings are done after covering the cakes in fondant and are very much popular among the couples. flower cakes for wedding ceremony ?